Marcus Rashford: keeping Lukaku out of the starting team. 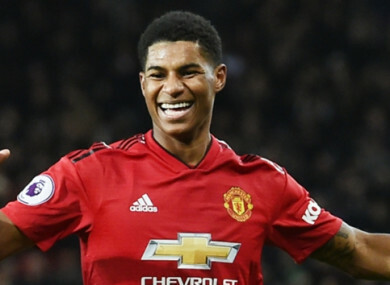 MARCUS RASHFORD HAS the potential to be a “top, top” striker, says Ole Gunnar Solskjaer, with it only a matter of time before the Manchester United star joins the likes of Harry Kane at that level. An Old Trafford academy graduate has never made any secret of the fact that he sees himself as a central frontman. Others have not always viewed him as the right fit for such a role, with a succession of Red Devils and England managers having sought to make the most of his pace and direct running on the flanks. Solskjaer has, however, moved the 21-year-old inside since succeeding Jose Mourinho and been rewarded for that show faith with a collection of impressive performances. Rashford, who has been keeping £75 million (€83m) team-mate Romelu Lukaku out of the side, now has six goals and as many assists for 2018-19 and is being backed to take his game to even greater heights. Interim United boss Solskjaer said of the youngster’s ability to be a leading man: “He’s got frightening pace, he’s now become stronger, he can hold the ball up for us and he’s a great link player. “He can become a top, top one. We can talk about Harry Kane and his class, and I’m sure Marcus has got the potential to get up there. He’s been brought up here. Rashford’s return to form under a coach prepared to back him appears to have brought an end to any questions regarding his future, having previously seen transfer talk sparked. Solskjaer, though, is yet to determine whether he will be staying on at United past the end of the season, with the Norwegian – who has seen those at Molde claim that they are expecting him back – not giving too much thought to his options. He said when quizzed on a possible extended stay in the Red Devils hot-seat: “We haven’t had that conversation. “You don’t plan five or six months or whatever it was and then suddenly after two weeks change that. United’s next test, and the biggest of a spell under Solskjaer which has delivered five successive victories so far, is set to take them to fellow Premier League top-four hopefuls Tottenham tomorrow. Email “Solskjaer tips Rashford to join Kane in a group of 'top, top' strikers”. Feedback on “Solskjaer tips Rashford to join Kane in a group of 'top, top' strikers”.